Dr. Nissman is a Resident and Dr. Hobbs was a Musculoskeletal Fellow in the Department of Radiology and Radiological Science, Medical University of South Carolina. Dr. Hobbs is now in private practice in Augusta, GA. Dr. Pope is a Professor of Radiology and Orthopedics and the Director of the HollingsCancer Center Breast Imaging Program; Dr. Geier is an Assistant Professor of Orthopaedic Surgery, Dr. Conway is a Professor of Radiology and the Director of Musculoskeletal Radiology, Medical University of South Carolina, Charleston, SC. 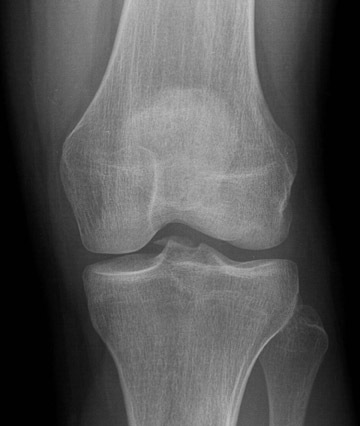 Injuries of the knee are common. At our institution, the Medical University of South Carolina, trauma and sports-related activities are the most frequent causes of knee injuries. Secondary to their role in maintaining stability, the ligaments of the knee are commonly involved in these injuries. To prevent long-term sequelae, early diagnosis and treatment-whether conservative or surgical-are key in planning management of these injuries. Because of its excellent soft-tissue contrast, magnetic resonance imaging (MRI) has proven very useful for identifying these important structures. 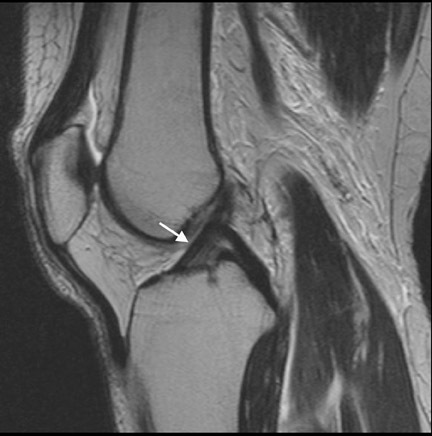 1-4 In the immediate postinjury period, clinical assessment of the knee is unreliable, which accentuates the importance of MRI as a diagnostic tool. 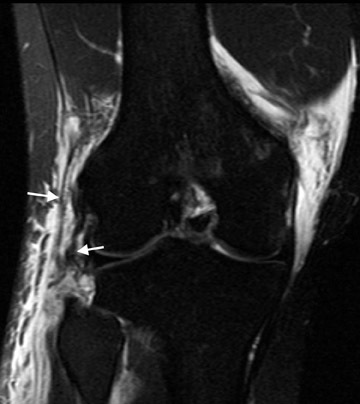 5 This article reviews the MRI appearance of the knee ligaments in their normal and injured states. 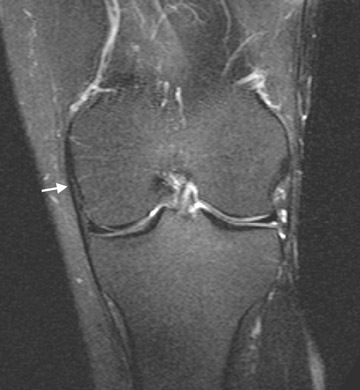 MRI protocols for the knee vary by magnet and interpreter preference. Protocols should include sequences obtained in the axial, coronal, and sagittal planes, with at least one fluid-sensitive sequence. In general, a high field-strength magnet and a dedicated knee or extremity coil is preferred, but adequate evaluation can be attained with mid- and low-field magnets. Patients are imaged supine with the knee in slight external rotation both for better visualization of the anterior cruciate ligament (ACL) and patient comfort. The authors do not use intravenous contrast unless evaluating for neoplasm or infection. Intra-articular contrast is used primarily in the patient who has had prior surgical meniscal repair. In general, the collateral ligaments are best evaluated in the coronal plane, and the cruciate ligaments and extensor mechanism are best evaluated in the sagittal plane. The coronal plane is also an important projection for the cruciate ligaments. However, visualization of all structures in all three imaging planes is necessary for a complete evaluation, which helps to avoid misdiagnosis. The ACL extends in an inferior, anterior, and medial direction from its origin on the inner surface of the posterior, lateral femoral condyle to its insertion on the anterior tibial plateau anterior to the tibial spines between the attachments of the medial and lateral menisci and beneath the transverse ligament. 7 It consists of 2 distinct bands—the anteromedial and posterolateral bundles—according to their distal attachment's relationship to the tibial spine. These bands function to resist anterior displacement of the tibia and hyperextension, respectively. Also, because of these two separate components, the normal ACL is taut throughout the full range of knee motion. 8 Further, the posterolateral bundle provides an element of rotational stability. The normal ACL is a low-signal-intensity band that roughly parallels the intercondylar roof (Blumensaat’s line). 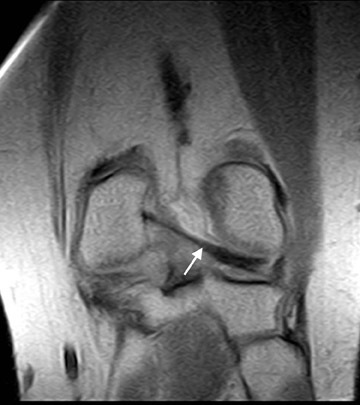 Normal interspersed fat and connective tissue give the ACL a striated appearance that should not be mistaken for pathology. 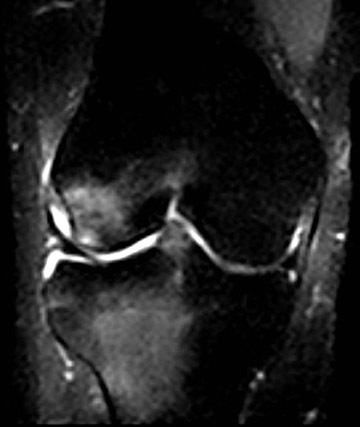 Usually, even with optimal positioning, the ACL is visualized on ≥2 contiguous sagittal images rather than on a single image (Figures 1 and 2). The ACL is commonly injured from excessive valgus stress, also called the “pivot-shift” mechanism. The classic example of this is the clipping type of injury seen in American football. 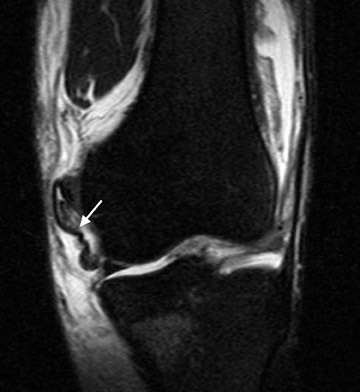 MRI signs of ACL injury are a pseudomass in the normal location of the ACL, frank discontinuity of the ligament, wavy or irregular course, or avulsion at either the femoral origin or tibial insertion. 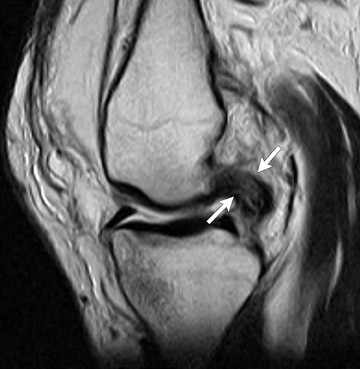 In the authors’ experience, the mid-substance “pseudomass” appearance resulting from edema and hemorrhage is the most common finding of an acute ACL tear. Occasionally, the “pseudomass” appearance can be caused by partial volume averaging on the sagittal image. 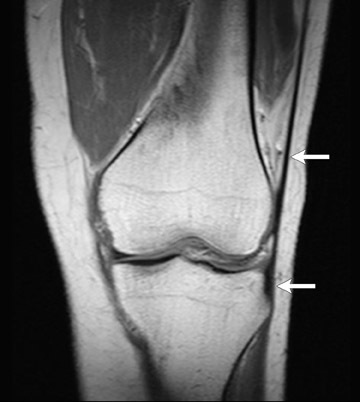 Apparent discontinuity on sagittal images can also lead to a misdiagnosis of an ACL tear. Correlation with axial and coronal images is imperative to help radiologists avoid these imaging pitfalls. 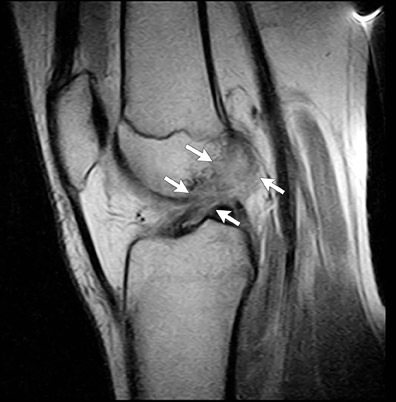 9 Two examples of complete ACL tears are shown in Figure 3. Secondary signs of an ACL tear include anterior tibial translation and abnormal curvature of the posterior cruciate ligament (PCL), which are related findings, with the latter secondary to the former. However, buckling or increased curvature of the PCL may also be seen with hyperextension of the knee in the setting of a normal ACL. “Kissing contusions,” a commonly seen secondary sign of ACL injury caused by the previously mentioned pivot-shift mechanism of injury, occur on the posterior aspect of the tibial plateau and the mid to anterior aspect of the femoral condyle (Figure 4). Medial and lateral meniscal tears usually involving the posterior horns, and medial collateral ligament (MCL) sprains and tears are also commonly associated findings. 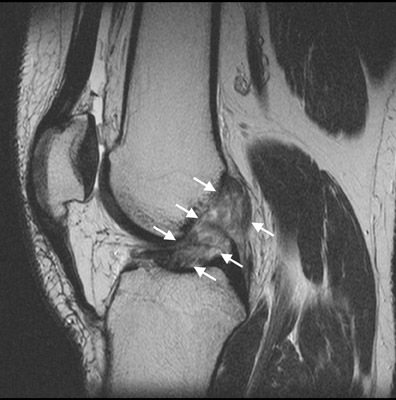 The Segond fracture, an avulsion fracture of the lateral joint capsule at its insertion onto the lateral tibial plateau, is associated with an ACL tear in >90% of cases when it is present (Figure 5). 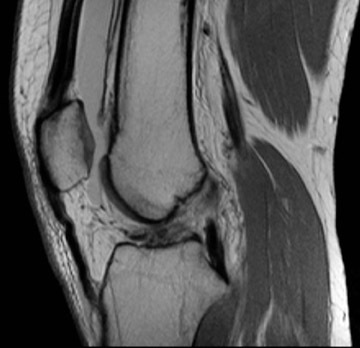 10,11 When any of these findings are seen at MRI, a careful assessment of the ACL in all three imaging planes is essential. 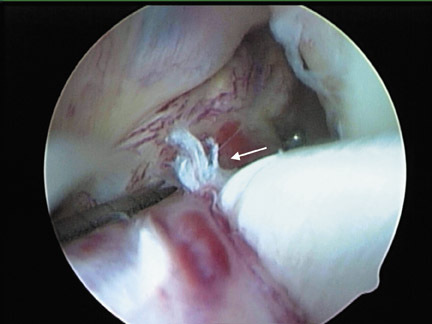 Recently, evidence suggests that patients with isolated ACL bundle tears, either anteromedial or posterolateral, benefit from single bundle repairs. 17,18 Additionally, complete tears may benefit from so-called double-bundle reconstruction, especially in light of the additional rotational stability provided by an intact posterolateral bundle. 19 Isolated tears of the posterolateral bundle are difficult to appreciate using standard arthroscopic ports. 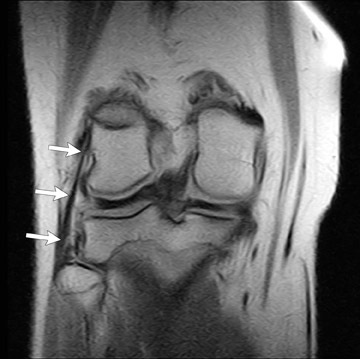 17 On MRI, identification of the individual bundles is complicated by the oblique course of the ACL on all imaging planes. 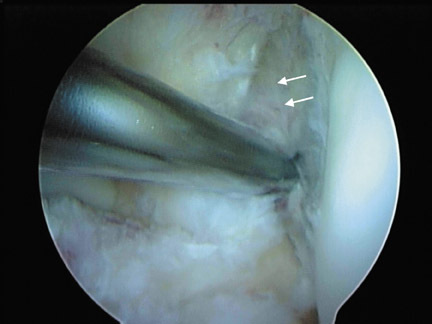 Careful inspection of the ACL in all projections may allow identification of an isolated bundle abnormality and help direct the orthopedic surgeon to the area at arthroscopy. As more orthopedic surgeons are performing these operations, identification of isolated bundle tears can be of great service to the patient (Figure 7). The appearance of chronic ACL tears is highly variable. 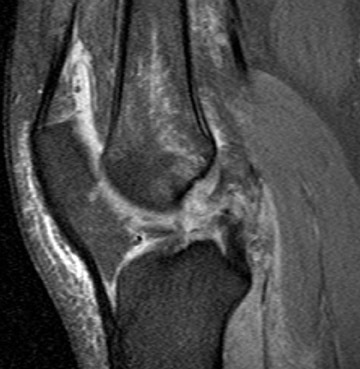 The fibrosis secondary to healing of the ligament results in signal characteristics similar to that of a normal ligament. The most specific findings of a chronic tear are an abnormal course or angulation of the ACL without other abnormalities normally associated with an acute tear. 20 In some cases of complete tears, the ACL will settle on top of the posterior cruciate ligament and, over time, will adhere by fibrosis to this ligament (Figure 8). The edema seen around and within an acutely torn ACL will be absent in a chronic tear. The PCL extends in an inferior, posterior, and lateral direction from its origin on the inner surface of the anterior aspect of the medial femoral condyle to its insertion on the far posterior aspect of the tibial plateau. Like the ACL, the PCL is also composed of 2 bundles: the anterolateral and posteromedial bundles. The significance of these bundles in terms of reconstruction is less clear than for the ACL. 21,22 The PCL functions to resist posterior translation of the tibia with respect to the femur, and portions of this structure are taut throughout the entire range of motion of the knee. 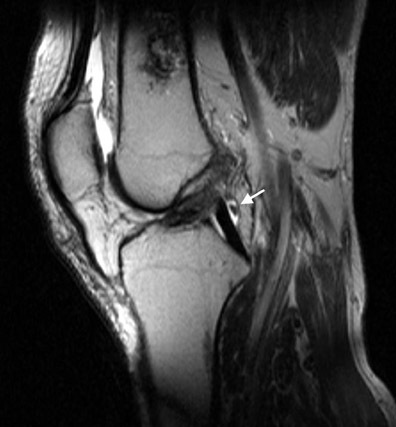 The normal PCL lacks the striations of the ACL and can often be seen in its entirety on a single sagittal image (Figure 9). The meniscofemoral ligaments are intimately associated with the PCL as they pass from the posterior horn of the lateral meniscus to the medial femoral condyle. On coronal imaging, this structure can be mistaken for abnormal thickening of the PCL, but correlation with sagittal images can clarify this finding. The PCL is less frequently injured than the ACL, and such injuries require a greater force. Therefore, there is often associated injury to other structures of the knee (usually the ACL and MCL) when PCL injuries are encountered. Mechanisms of injury to the PCL include hyperflexion, hyperextension, and dislocation. Posterior cruciate ligament tears are often difficult to diagnose clinically in the acute setting and can be difficult to evaluate at arthroscopy secondary to its far posterior location. 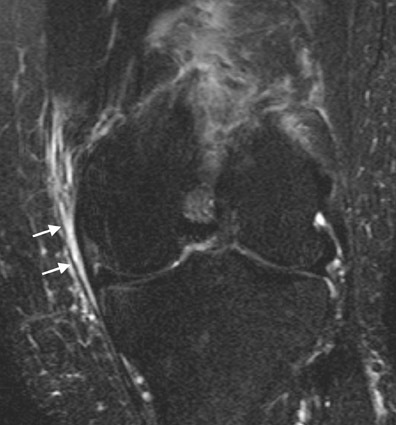 Therefore, MRI is critical in the diagnosis of this entity. 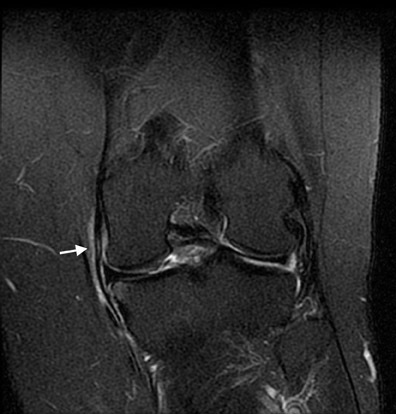 Signs of injury include frank disruption of the ligament, diffuse midsubstance widening with increased signal intensity on T1- and T2-weighted images, or an avulsion of either its femoral origin or tibial insertion. 23 Partial tears are recognized by abnormal signal intensity within an intact ligament. Of note, if the PCL appears higher in signal intensity than the ACL on any imaging sequence, it is considered abnormal. See Figures 10 and 11 for an example of a partial and a complete tear. The MCL arises from the medial femoral condyle approximately 5 cm above the joint line and extends to insert on the medial tibia approximately 6 to 7 cm below the joint line posterior to the insertion of the pes anserinus. 24 The MCL actually consists of 2 layers separated by a small bursae and minimal peribursal fat. 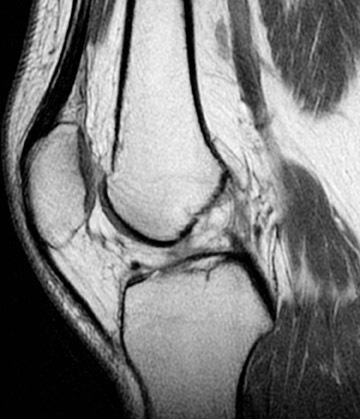 The superficial MCL is the true tibial collateral ligament. The deep layer is contiguous with the meniscofemoral and meniscotibial ligaments of the medial meniscus. The MCL functions as the chief valgus stabilizer of the knee and is therefore most commonly injured with abnormal valgus angulation of the knee. As mentioned, the MCL is best visualized in the coronal plane, where it is normally seen as a linear, low-signal-intensity structure (Figure 12). 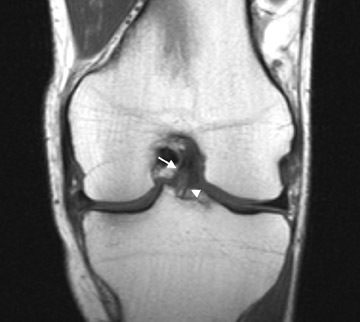 Meniscal injuries are graded as 1 through 3 based on imaging findings. 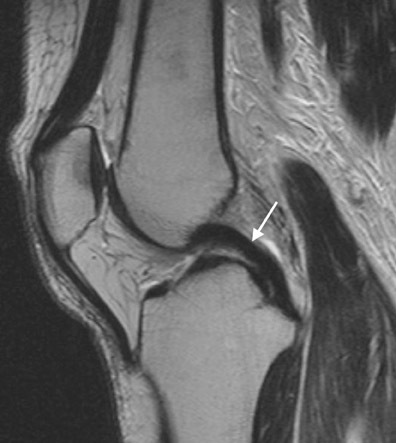 Adjacent edema with no signal abnormality within the ligament is characterized as a sprain, or grade 1 injury (Figure 13). More extensive edema with abnormal signal intensity, thickening, or thinning of the ligament signifies grade 2 injury, or partial tear (Figure 14), and complete disruption of the ligament or its attachments qualifies as a grade 3 injury (Figure 15). 25,26 Injuries of the MCL are commonly associated with medial meniscal tears and meniscocapsular separation. Meniscocapsular separation is defined as disruption of the normal tight attachment of the MCL to the medial meniscus and joint capsule. 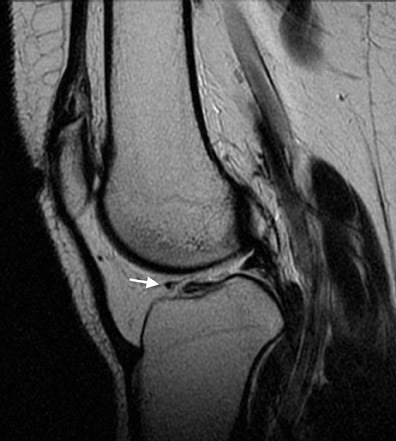 It is recognized on MRI as fluid signal interspersed between the MCL and medial meniscus. A potential pitfall in this diagnosis is fluid in the deep MCL bursae separating the superficial and deep components as mentioned above. The characteristic appearance and location of this bursa helps the radiologist avoid this error. Laterally, the knee is stabilized by a group of structures, collectively known as the lateral collateral ligamentous complex (LCLC), which resist varus stress and external rotation. 27 The most important of these structures, from anterior to posterior, are the iliotibial band (ITB), a continuation of the tensor fascia lata inserting on Gerdy’s tubercle on the anterolateral tibia (Figure 16), the fibular or true lateral collateral ligament (Figure 17), and the tendon of the biceps femoris muscle that converges with the fibular collateral ligament to form the conjoined tendon prior to inserting on the fibular head (Figures 18 and 19). 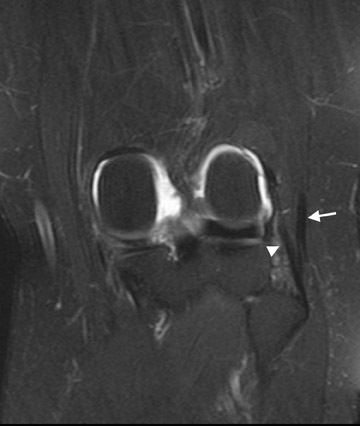 The popliteus tendon also contributes to lateral stability and should be evaluated for injury on knee MRI, but will not be discussed further in this article. 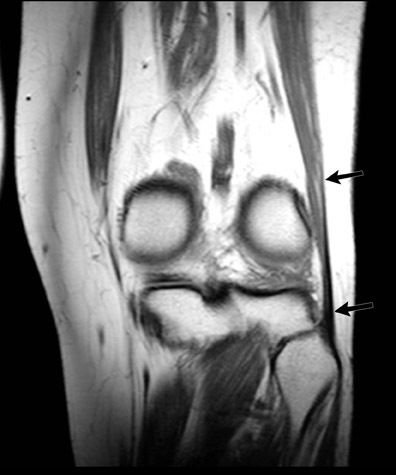 The transverse meniscal ligament and the meniscofemoral ligaments are other commonly visualized knee ligaments on MRI. The transverse meniscal ligament is a thin, fibrous band that connects the anterior horns of the menisci. 29 The ligament is occasionally misdiagnosed on sagittal images as a tear of either of the anterior meniscal horns where it inserts on these structures. 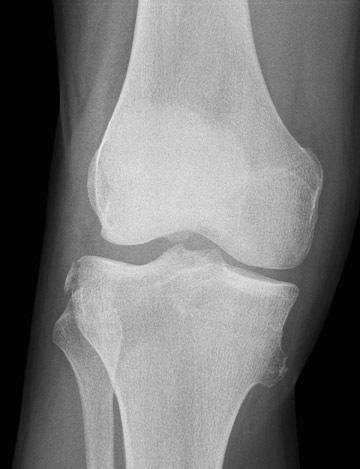 Knowledge of this structure's normal ap pearance and following it across the joint space on contiguous sagittal images will help radiologists avoid this pitfall (Figure 21). Again, these structures are important primarily in that knowing their normal appearance and position can help a radiologist avoid pitfalls in diagnosis. 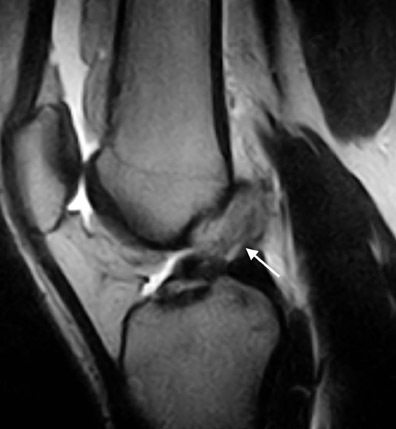 A prominent Humphry ’s ligament can occasionally mimic a flipped meniscal fragment from a bucket-handle tear or a loose body in the intercondylar notch. Also, similar to the transverse meniscal ligament, the attachment of the menisco femoral ligament to the lateral meniscus can occasionally mimic a meniscal tear. Injury to the knee ligaments is relatively common. 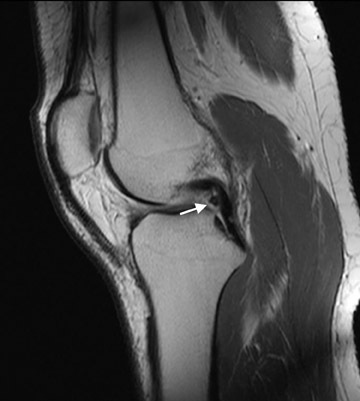 MRI is the best imaging technique available to identify these abnormalities and to plan arthroscopic or open surgical repair. 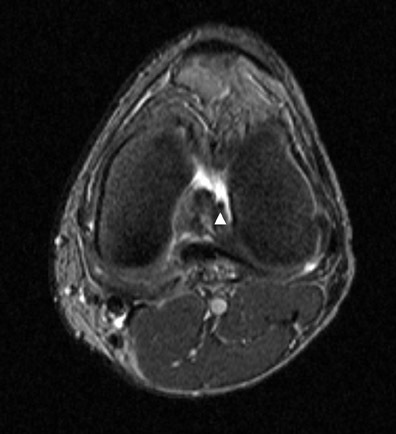 Knowledge of the normal MRI appearance of the major knee ligaments and the most common findings seen following injury to these structures is critical for the interpreting radiologist to be a successful imaging consultant. 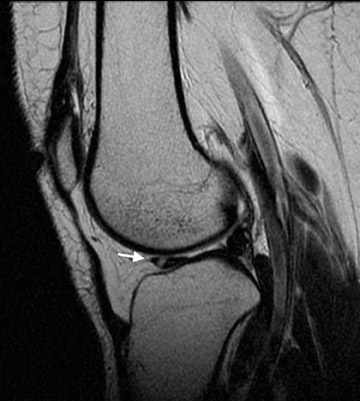 Imaging the knee: Ligaments. Appl Radiol.